I quite like being tall. It helps in the supermarket when the only pair of BOGOF biscuits are left on the top shelf. It’s useful at music festivals when you can look over people’s heads to see the band. It’s also quite good when you’re decorating walls and you don’t have to keep using and moving the ladders to paint up to the ceiling. However, today was not a good day to be tall. 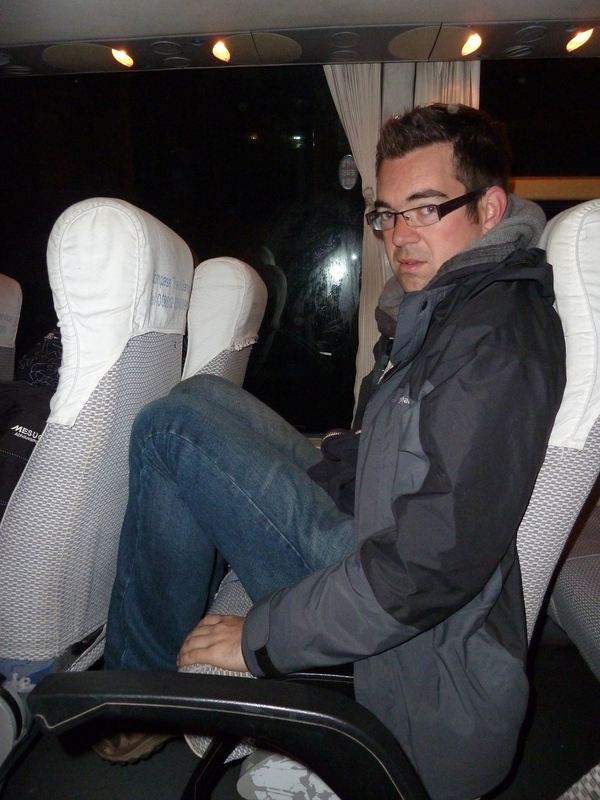 Our bus to the Great Wall of China picked us up at 6am. It was still dark, slightly chilly and far too early. None of us had slept very well as we knew we had to be up at the crack of dawn. 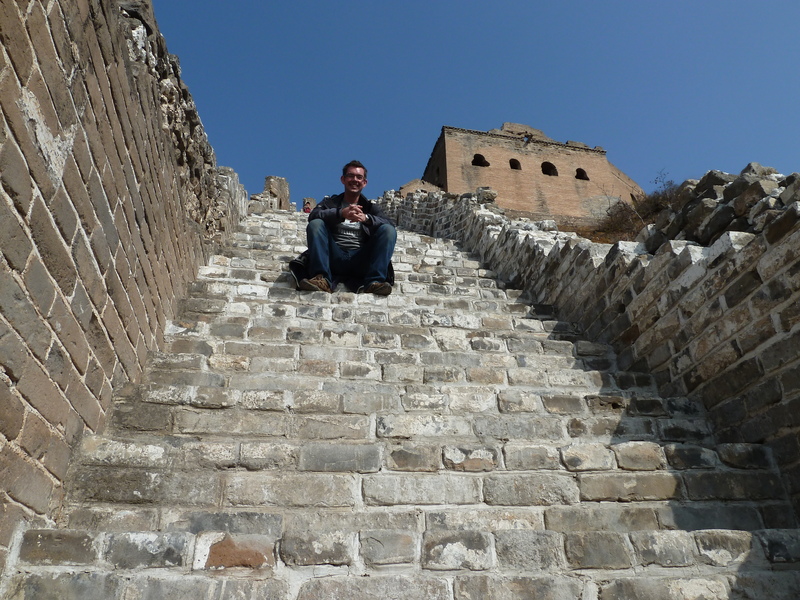 We had chosen to go to Jinshanling, a part of the wall that had been recommended as it was only partly renovated so was in ruins in some parts, while it boasted amazing views of the mountains and fewer tourists than other spots. 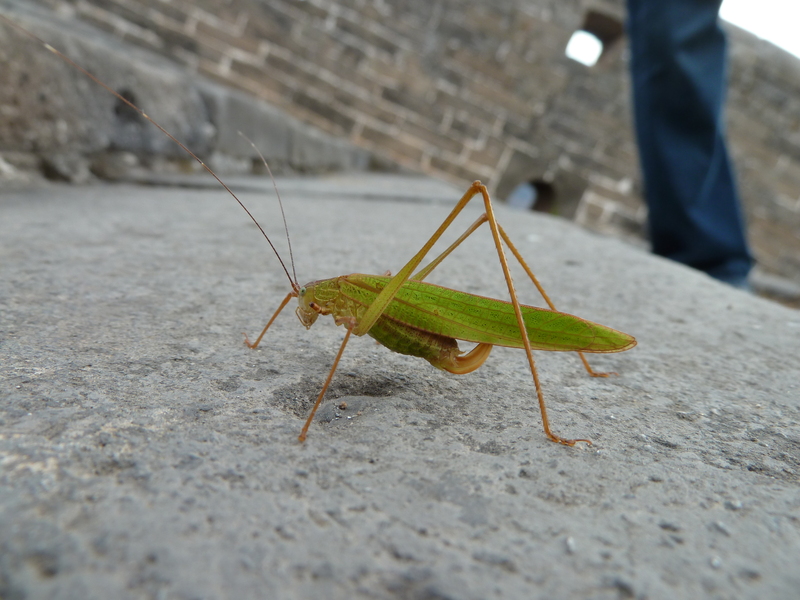 There’s the odd horror story of not being able to move for hawkers and tourists at the popular spot of Badaling, where it has all been repaired and made to look immaculate. 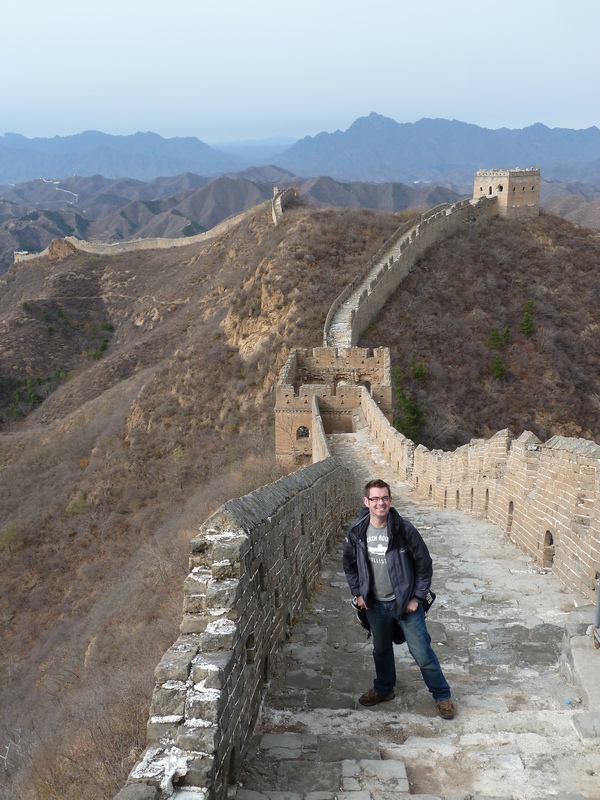 To me, that’s not the proper wall, so we shelled out a bit more, around £30 in total, to go somewhere better. 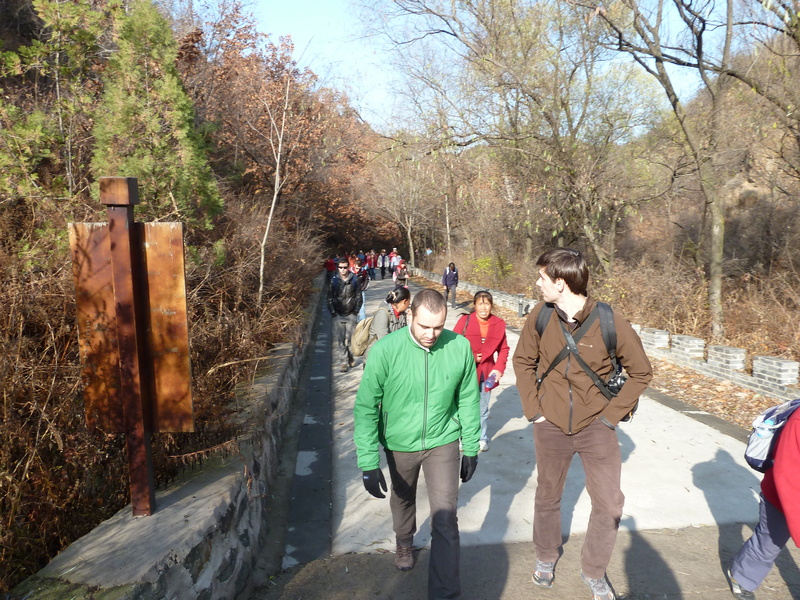 The only problem was its around 170km north of Beijing and takes over three hours to get there, hence the early start. The bus, however, was made for Chinese people, who are, shall we say, quite a bit shorter than people from other parts of the world like Europe…and Grimsby. Therefore, buses in China can be made smaller, but still contain the same number of seats, as little people mean little legs – producing some of the most ridiculously packed in displays of awful leg room I have ever experienced. So at 6am, facing the prospect of having my knees up to my chin for more than six hours, it was not a good start to the day. Combined with the fact the bus had seen better days and my chair fell off the base every time the driver stamped on the brake – which he did a lot – even the Mcdonalds breakfast provided by the tour driver failed to crack a smile. Thankfully the bus wasn’t full, so we were able to at least twist ourselves into a slightly more comfortable position, even getting some sleep on the way. The scenery on the way was great, and there were plenty of glimpses of the Great Wall as we drove through valleys and passed mountain after mountain, arriving at Jinshangling at 10.30am. We were shown a map and told there would likely be a few farmers wives following us, trying to sell us souvenirs. 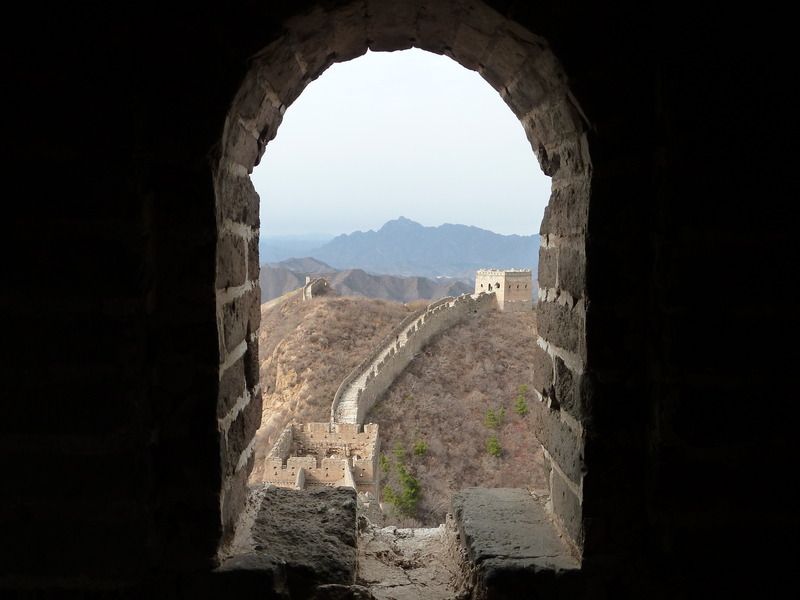 It was pointed out that it was a long way to the far end of Jinshangling’s wall, but the better, fitter people might be able to make it. A five windowed tower was pointed out, but there was a warning that we had to be back for lunch at 1.30pm, and the bus left at 2pm. Naturally, that was seen as a challenge by the blokes, and we set our sights on it. By now Id started talking to a guy called Justin. He’d been sat in the seat in front of me on the bus, and I’d broken the ice by letting him know he could recline his chair if he wanted to. 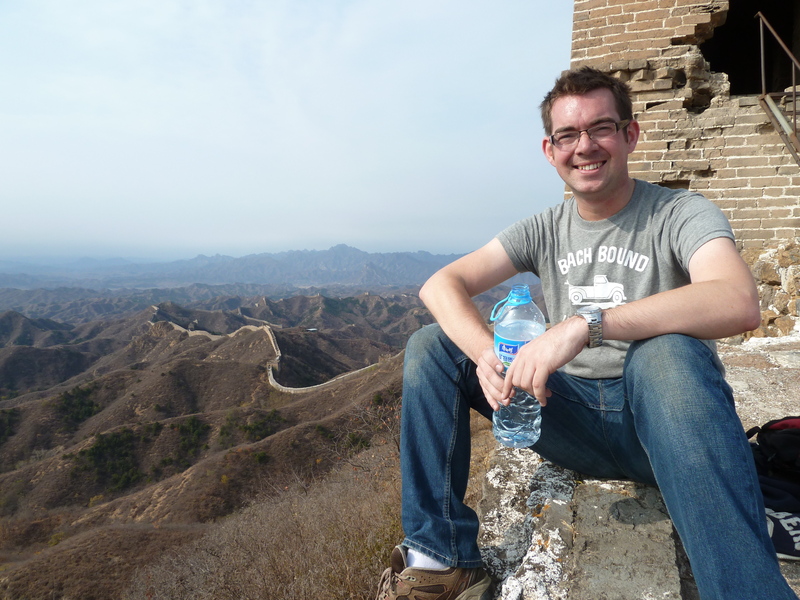 Justin is originally from the UK, but now lives in San Francisco and works as a computer chip designer in Silicon Valley. 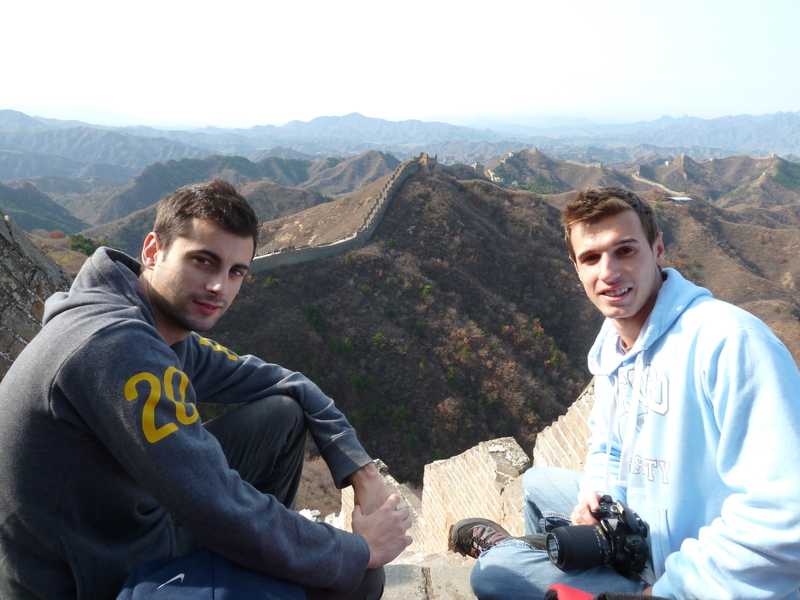 We agreed that we’d stick together and help with photos, and along with Santi and Galli, we set off to walk the wall. We hadn’t got far when we noticed our small group had more than tripled in size. Looking back was like something akin to the Pied Piper, with about 30 older women following us all. We just presumed they’d get fed up after a while and leave us all alone, but we were wrong. 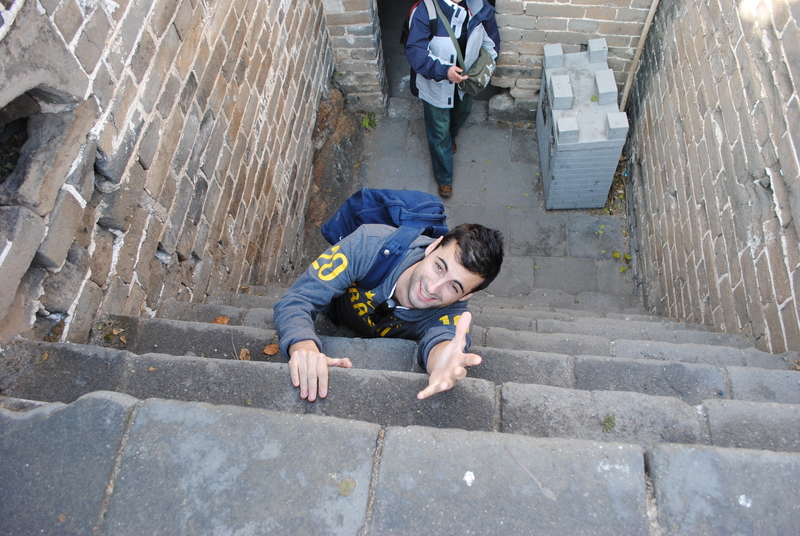 Justin, Santi, Galli and I set an early pace, marching off up the steps to the wall at a decent pace. Then two French guys took over and stole our thunder, but they were welcome to it, there was no way we could keep up the speed! The old dears following, however, could more than keep up. We soon reached the wall, and after a climb up some final steps, soon had a great view of its twists and turns across mountain tops as far as the eye can see. Its only when you get on top of the wall that the full scale of it hits you. To think that it crosses such an enormous distance, and was built so many years ago, is incredible. 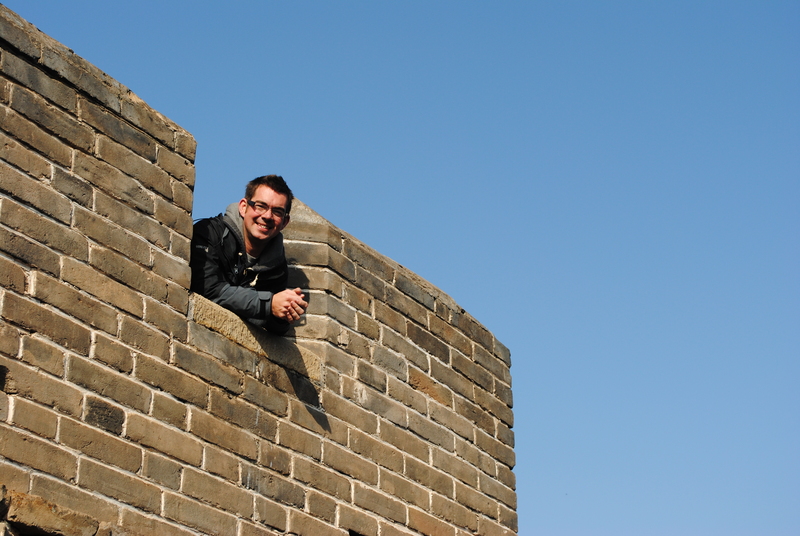 After a few photos, we noticed others had started moving on, and so the wall walk began. We had been warned that this section of the wall was more of a ‘hike’ and only recommended for people who could manage. 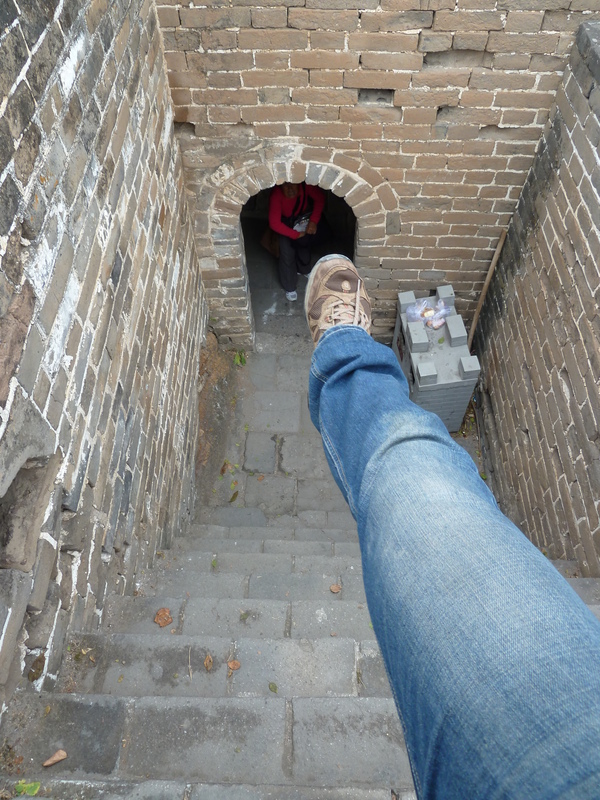 It started out as a breeze, with nicely paved, and obviously restored, walkways through watch towers and around lookouts. The weather was perfect for it, with the sun in a great position and distant mountains shrouded in a slight mist. 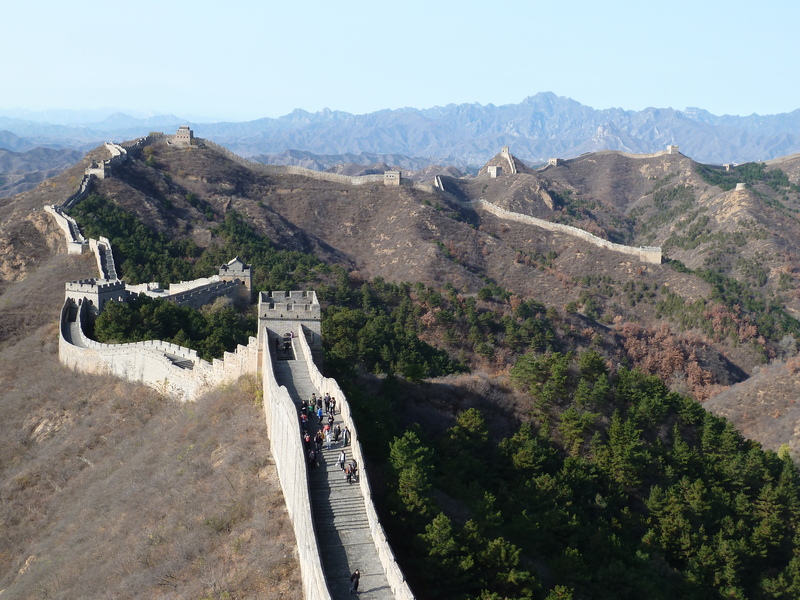 It was the picture postcard image of the wall that I’d seen countless times on travel programmes or in magazines, but nothing prepares for being there in person. Nothing prepares for the incessant chase by the farmers wives either! 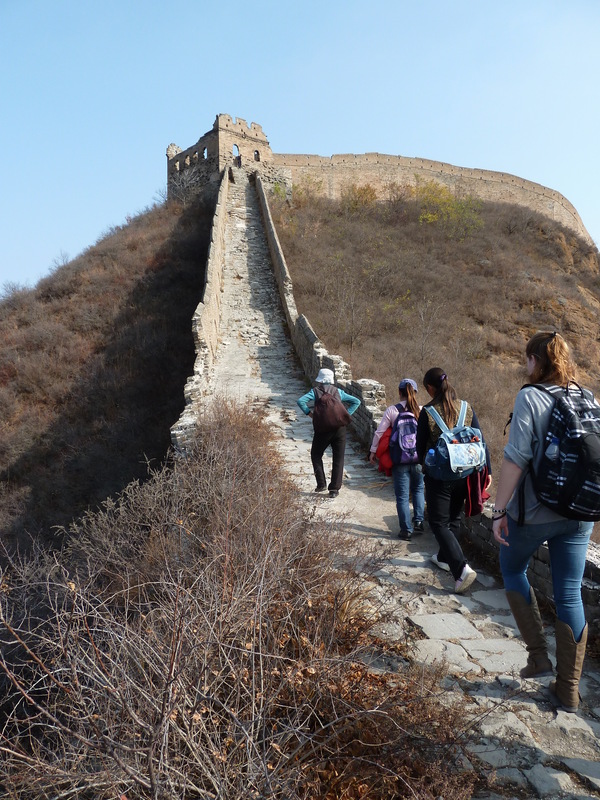 We walked for around half a mile on the restored wall before we started hitting the crumbling ruins, but still they were very passable. Most of our group were still keeping up, and we’d take it in turns to have a quick joke and a smile as we continuously overtook each other, took photos, got overtaken again and so on. There was a really good spirit among everyone. 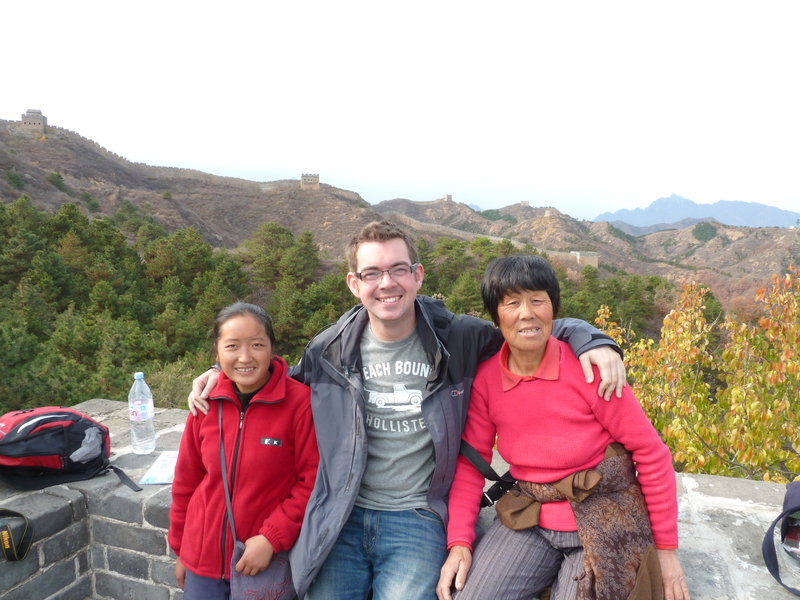 By now, Justin and I had realised there were two women following us, and showed no sign of giving up. We quietly joked between us – not that they would understand – that we had a couple of chaperones desperate for our money. Me being, well, a bit tight, was having none of it. 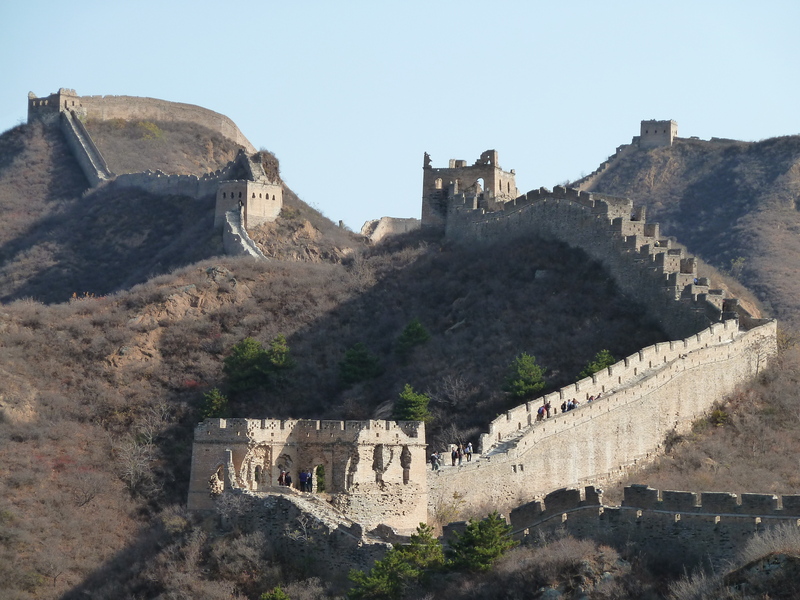 If I wanted a piece of tat or a book about the Great Wall, I’d go to the souvenir shop at the end. Determined to shake them off, we agreed to step up the pace, and were now almost at a slow run. And still, they kept up. 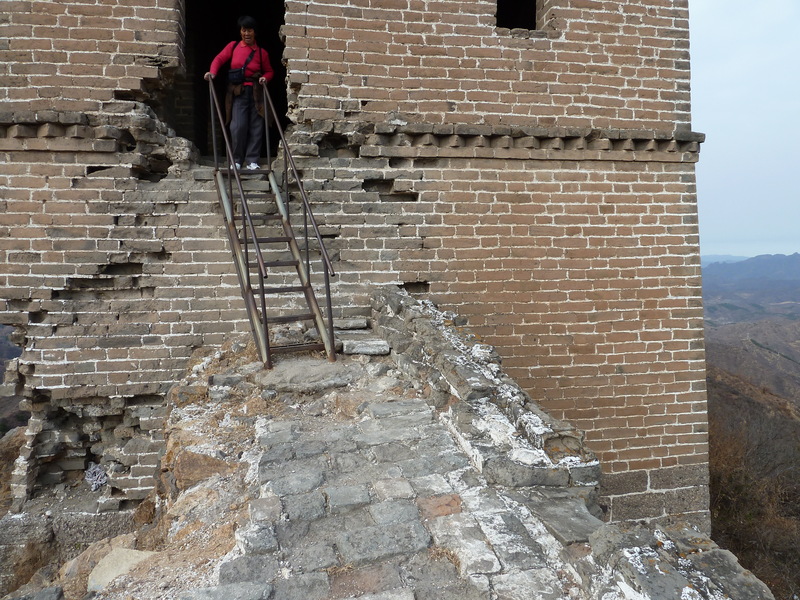 The wall had, by now, hit some incredibly steep bits. 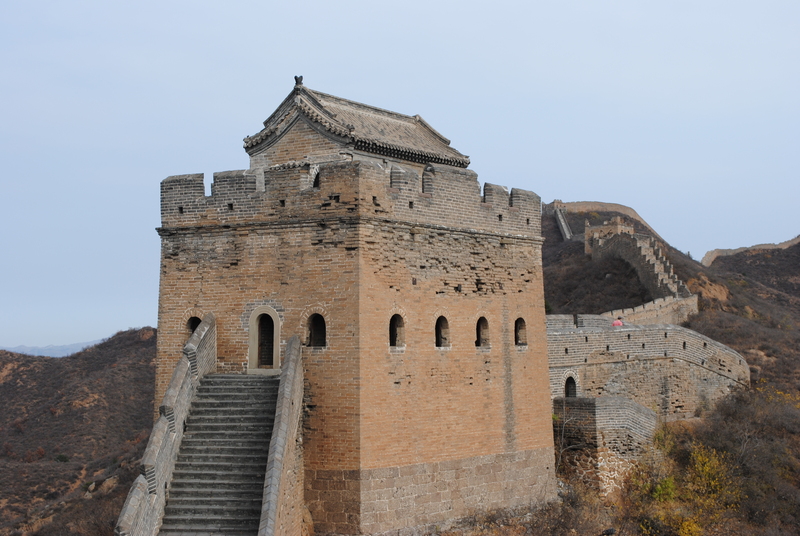 After climbing to one watch tower, the wall snakes down into another valley and up an even steeper climb to the next watch tower. At one point, up to the Flower Tower – so called as it had doors and windows made with flower-engraved marble – there was a rise of around 100 particularly steep steps up an almost vertical hillside. Our older ‘chaperone’ somehow shot off up them like a rat up a drainpipe, but not wanting to be outdone, I shot up them even faster, overtaking her halfway up and then struggling all the way to the top without stopping, and somehow without passing out. Suddenly, the warning you had to be fit started to hit home. Our smiling chaperone decided to give me a round of applause and offered the words ‘do you want a book’. I decided against pushing her off the wall. By now, Gali and Santi had decided to stop. Gali has a dodgy knee, caused by bad shoes apparently, which has messed up his tendons. It’s why they both have rather snazzy wheely suitcases instead of the usual backpacks, as weight on Gali’s back causes more problems. Justin and I said goodbye at one of the towers, and set our sights on the five-windowed tower about a mile away. Not a bad view to leave Santi and Gali with! For a moment, our group splitting in two confused the two women, but they quickly decided to give chase. Justin and I walked even faster, but nomatter what we tried or how fast we went to lose them, they would not slow down. While we were gradually losing layers, gasping for air, having breathers and stopping for water, they were breezing it like an evening stroll along Cleethorpes prom. “Be cawfool,” they would say as we crawled our way up and down some of the worst parts of the wall, at some points on our hands and knees among the rocks and boulders which have come loose. By now, time was starting to get on, and we set ourselves a cut-off point of midday, at which point we would turn back. At 11.30am, we still had a fair way to go, but we could see the tower we were aiming for. It was a good challenge, and it was fun to keep stopping for photos as every twist and turn in the wall revealed more stunning shots. We made the five-windowed tower with 10 minutes to spare. It meant a well deserved rest and a Snickers. The two French guys who overtook us at the start were also there – apparently they had walked another kilometre ahead and were already on the way back. They said the view was stunning from the next tower. I told them I was happy with the view from where I was – I couldn’t go any further! 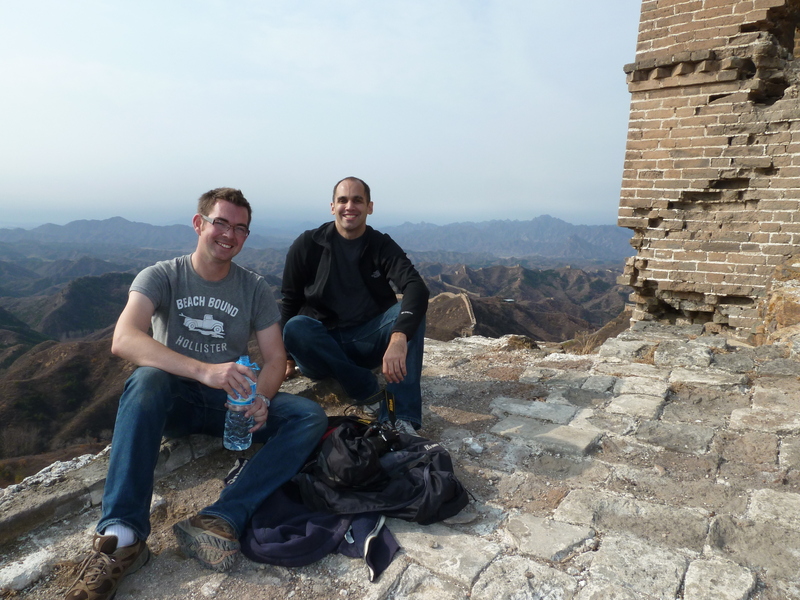 Justin and I chatted about what our reasons were for travelling at the top. 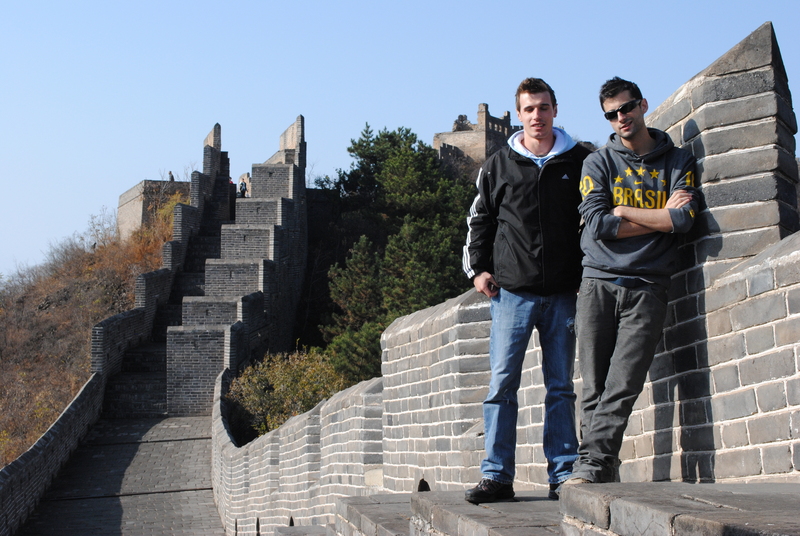 We both sat on the edge of the wall with a fantastic view of it disappearing into the distance. He told me he’d quit his job as he wasn’t getting on with his boss, and so had a few weeks to travel. I told him about Mongolia and the rail journey and he admitted he was tempted to go stay in a yurt! It was one of those chats that you have and then suddenly pinch yourself. Looking out, it dawned on you that you were sat on top of one of the wonders of the world. It may not, contrary to popular belief, be visible from space, but how on earth this incredible structure was built is baffling. It sits right on the mountain tops, and if it seems hard enough to walk and climb along it, quite how they managed to cart millions of tonnes of rock to the tops of these mountains to build the thing is beyond me. Quite how the two old dears had managed to stick with us all the way was also beyond me, as they both stood grinning from a doorway. “We’ll have to give them something at the end. They’ve earned it,” Justin said. Just after midday, we took in our final views from the top of the wall and started the hike back. The two women told us there was a short cut, that seemed to go along an eroded cliff edge. 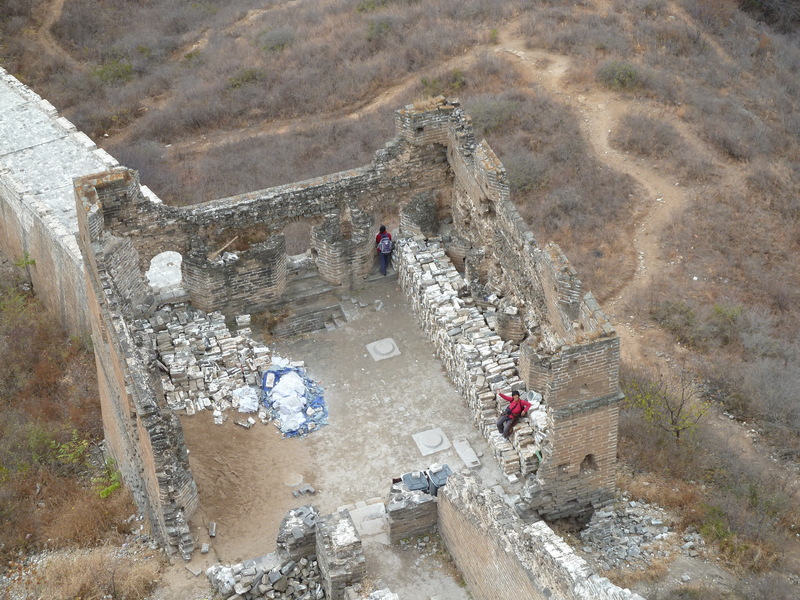 We decided to stick to the wall ruins, as precarious as they were in places, but sure enough, we soon saw their smiling faces way below us as we slipped and stumbled our way down some loose and slippery steps. We were back to the wall entrance well within the time limit – after all, we didn’t want to be some of ‘those’ people that hold the group up! 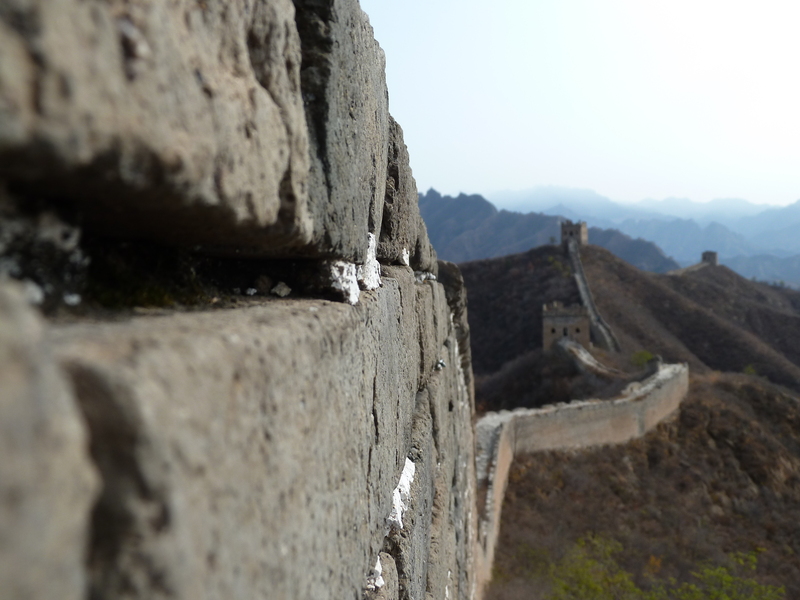 But before we went for lunch, the final sales pitch came from the older woman, brandishing a book full of details about the wall and I have to admit, some particularly good photography. “Onwee 120 yuan. I’m poor, no food, fwom Mongowia,” she said. Yes, that is my follower below! Justin and I had already agreed on the walk back we’d give them something – we’d deliberately waited until the end incase one or both of us slipped and broke a leg, so at least there’d be someone around to help! And we both agreed, although we didn’t ask them to follow us, nor sell us a book, that they had worked bloody hard for the equivalent of £12. Except I only had 100 Yuan left in my wallet. Justin bought his without bartering, but I thought I’d try my luck by offering the crisp 100 note. “No, 120,” she said, flashing me another toothy smile. The only other notes in my wallet were three US Dollar bills and a 500 Icelandic Krona note, somehow still languishing in there from my work trip the month before. Its a similar size and colour to a Chinese 100 yuan note, but quite simply, useless in the depths of China. My new friend, however, was intrigued. Unsurprisingly, it was the first time she’d seen Icelandic money. 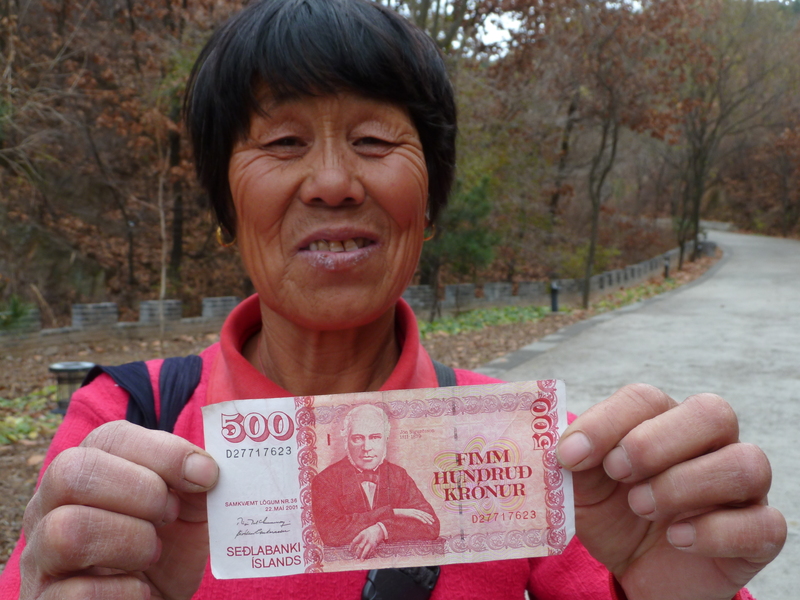 My final offer turned out to be 100 Yuan, three dollars, a pound coin and 500 Icelandic Krona. I managed to avoid offering some scruffy receipts or the shirt off my back. Justin had only known me a few hours, but I could tell he was rolling his eyes! “Ok, ok,” she said, mercifully. We walked back towards the café together, and Leovantin was clearly joking with her friend and looking at the Icelandic note. I was busy working out I had paid far more than the asking price of 120 Yuan – not that she would believe me! Chuffed - and with a lip of Blistex! Lunch was cold rice and noodles that I couldn’t really stomach, and so we headed to the bus. Leovantin was waiting for the next group of tourists to arrive. That afternoon she would do the gruelling hike all over again. This entry was posted in Travel, Uncategorized by afishoutofgrimsby. Bookmark the permalink.